Hailed by The New York Times as a “best-kept secret” with an “impressively absorbing” debut album, Becca Stevens has established herself as a singer/songwriter of enormous talent whose songs expand and blur the boundaries of folk, jazz, and pop while engaging the the listener through keen poetic observation, rich musical language, and beguiling singing. Her musical roots are in classical guitar, the folk music of her native North Carolina, and jazz, with additional influences ranging from West African rhythms to eccentric pop. 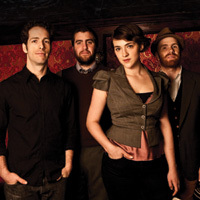 Along with being band leader and composer/arranger for the Becca Stevens Band, Becca's career takes her in many directions – from recording and touring internationally as lead singer of Travis Sullivan’s Bjorkestra and with jazz pianist Elan Mehler, to writing lyrics and recording on Max Jazz with trumpeter Jeremy Pelt. Becca began her artistic career while still in diapers, singing and performing with her family band, the Tune Mammals. Her childhood was spent on stage, singing, acting, and dancing, including a year-long tour as the lead in The Secret Garden when she was ten. In 2002 she received her high school diploma from the North Carolina School of the Arts where she studied classical guitar, and then went to The New School for Jazz and Contemporary Music in New York City where she received a BFA with high honors in vocal jazz and composition. It was at The New School that Becca met the musicians who would eventually make up the Becca Stevens Band. Stevens's "Weightless" Reviewed in Jazz News! Becca Stevens's "Weightless" reviewed in the January/February issue of Jazz News (France).